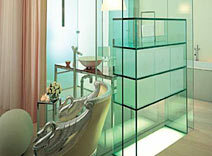 Location & Transport Ideally situated in the heart of London's West End, just north of Soho and close to Bond Street. The Sanderson's excellent location makes it an ideal base for eating out, shopping and nightlife, within walking distance of Leicester Square, Covent Garden, museums, and London's business, media and fashion districts. 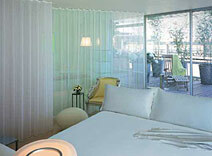 Sanderson is the latest 5 star deluxe property to join the Ian Schrager group of hotels, offering cutting edge, unique accommodations. A lavish "Urban Spa" in the heart of London's West End, Sanderson offers a retreat from the bustle of the city into a world of fantasy and wellbeing. The landmark 50s building has been transformed by designer Philippe Starck into a surreal Cocteau-like dreamworld with a lushly landscaped interior courtyard garden. Sanderson epitomizes a "new luxury" that is smart, pared down, and tempered with a healthy dose of wit and irony. A world-class hotel for the new millennium, this is the destination of choice whenever you are in London on business or pleasure. In the world of hotel guestrooms, Sanderson's are truly unique and groundbreaking. Designed without interior walls, the bathroom and dressing room are instead encased in a glowing floor-to-ceiling glass box that is wrapped in layers of sheer curtains. Wildly romantic, sensual and dreamlike, the 150 guestrooms, some with private gardens, feature silver-leafed sleigh beds, rugs inspired by Voltaire's handwriting and oil paintings of soothing landscape scenes that are hung, unexpectedly, on the ceiling. All rooms have panoramic views of London or overlook the lushly landscaped courtyard. The Long Bar is a spacious informal setting whilst The Purple Bar offers a more intimate setting, giving haven to patrons wishing unwind after a long day. 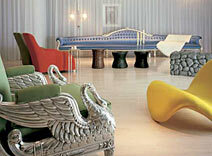 The critically acclaimed Spoon restaurant benefits from the culinary skills of world renowned chef Alain Ducasse. For those in need serious pampering there is Aqua - a two-story holistic bathhouse with its luxurious treatment rooms, a yoga and wellness studio, health bar as well as a 24-hour gymnasium with indoor/outdoor training classes with personal trainers. A hedonist delight, the 10,000 square foot agua Bathhouse provides pampering, spiritual relief and tranquility. With its miles of diaphanous white curtains, treatment rooms, chill out zone, the bathhouse has a peaceful dreamy ambiance. Sanderson features multi-service meeting spaces and hospitality suites, an Executive boardroom, state of the art audiovisual and telecommunications equipment, production wardrobe, makeup and casting rooms, as well as a private conference facility. Plasma monitors for audiovisual playback, smart boards, electronic flip charts, portable computers, mobile phones, fax machines and multi-lingual secretarial staffing are available upon request. Rates are subject to availability. Call us for best rates. The rates are per room only per night and include VAT. You may cancel up to 48 hours before your date of arrival and there is no charge. If you cancel after this time, you will be charged for the first night's stay. Our Comments We warmly recommend this truly unique 'Urban Spa' hotel. The Sanderson Hotel is ideally located in the centre of town and offers a haven of tranquility in the midst of the hustle and bustle of our fair city. 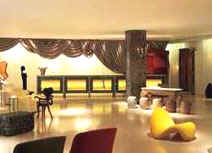 Stunningly beautiful and serene, this hip contemporary boutique hotel will leave you speechless. Book it and love it. I know we did!